President Donald Trump has had enough of Nancy Pelosi’s game playing. 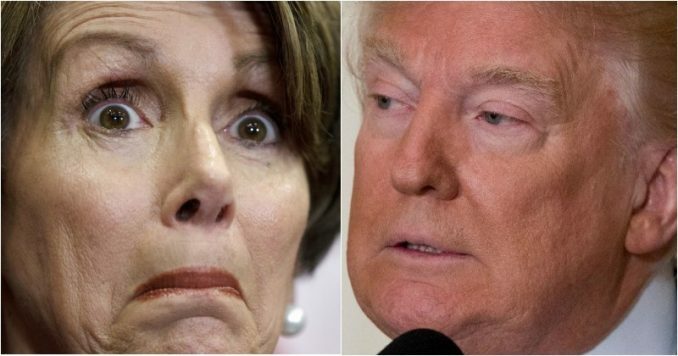 Trump asked, “Why is Nancy Pelosi getting paid when people who are working are not?” The president went on the offensive against the Speaker of the House after she was caught making a “big blunder” that is affecting the entire country. Pelosi is going to have a hard time covering this up. Don’t miss this. It sure seems like the Democrats don’t give a damn about the American workers who are hurting due to the government shutdown. Or the Americans who have been killed by illegal aliens. In fact, Nancy Pelosi was just caught making a big blunder making sure there is no end to the shutdown. And that’s why President Trump just lashed out at the Speaker on Twitter. “Why is Nancy Pelosi getting paid when people who are working are not?” Trump tweeted Tuesday morning, as he presses Pelosi and her colleagues to fund construction of a wall along the southern border. But that’s not all. Press Secretary Sarah Sanders just revealed Pelosi rejected the president’s offer to meet at the White House to negotiate a way forward to end the shutdown. Of course, Nancy is trying to cover this up. The 78-year-old Speaker is willing to hurt American workers at any cost just to score political points against Trump. Senate Leader Mitch McConnell took to the Senate floor to make it clear this is now Pelosi’s shutdown. McConnell charged that Pelosi, the “very distinguished congresswoman from San Francisco, has decided that opposing President Trump comes before the security of our borders.” The Kentucky Republican’s remarks on the 24th day of the government shutdown were his sharpest yet for Pelosi, his new sparring partner for the next two years, reported McClatchy. “Monday, though, McConnell noted Senate Democrats had long supported various barriers at the border but were now siding with Pelosi and her ‘far left base’ whom he accused of putting ‘the politics of obstruction’ before policy-making. He cited Pelosi’s joke earlier this month that she might give Trump $1 for his border wall,” added McClatchy. “There was bipartisan support in the Congress for billions of dollars for physical barriers at the border before Representative Pelosi was Speaker,” McConnell said. Then, after refusing to meet with the president, Pelosi had the audacity to lay the blame on Trump and the Republicans for workers not getting paid. She forgets to mention she is the one refusing to negotiate. President Trump’s latest strategy was to splinter the Democrats. He has been reaching out to freshman Democrats hoping they hold no alliance with Pelosi while appealing to their common sense that our national security is a bipartisan issue. But that didn’t work, either. So who is to blame for the government shutdown? As President Trump has often said, he didn’t need this fight. It would have been easy for him to just walk away and blame the Democrats. This crisis on the border has been going for over 30 years. It’s the fault of our lazy politicians who have kicked the can on immigration reform. President Trump knows while the Democrats are trying to score political points hoping to hurt his chances in 2020, the American people are counting on him to not back down. Nancy Pelosi will continue the shutdown as long as Americans think it’s the president’s fault. That’s why it’s so important that all Americans realize she has no intention of meeting with the president. If Pelosi doesn’t sit down with Trump, then how can they come to an agreement? Let’s make sure Pelosi knows Americans aren’t fooled by her game playing. American lives and our national security is at stake. It’s the Democrats under Pelosi’s orders who would rather see dead Americans than a simple border wall.